This morning included a cool 8 mile run. 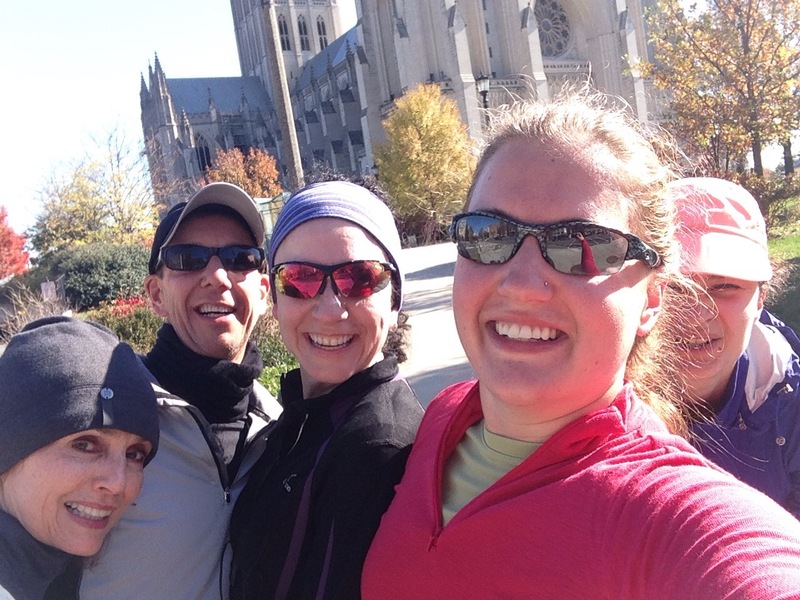 A couple friends are doing a half marathon next weekend so a group of us joined them for their last Saturday run pre-race. Last weekend we couldn’t decide on a route so I took it upon myself to plan a route for today. I think I came up with a good one, it started running up Mass Ave (which is a giant hill if you’re not familiar with DC) but then it evens out and the finish is downhill. Considering most of our runs are out and backs with an uphill finish, I was very pleased with this route. While running up the Mass Ave hill (which, to be fair, is more than a mile long) I was asked multiple times why I wanted to torture them. Easy answer: I LOVE MASS AVE! One of my favorite stretches to run. We were so proud of ourselves when we finally arrived to the National Cathedral at the top that we had to take a photo. We decied to call it a we-ie. It’s surprisingly hard to fit five people in a photo! I need longer arms, I think. The rest of the run beyond the Cathedral seemed very easy! See? It’s a mental game. Put the hardest part at the beginning and the rest seems easy! Katya couldn’t join us but she made sure to leave me a real New York bagel in her doorway so my post run meal today was a bagel sandwich. Yummmm! Now I’m just so darn content. I love running in cool weather. It was upper 30s on our run this morning, just about perfect for running I think! A hot shower and then coffee and bed for several hours. Is there any better way to spend a Saturday? ← I am now an indoor cycling instructor.